The Brain and Emotional Intelligence: New Insights - Jon Lieff, M.D. This book is a very clear introduction to the latest neuroscience related to emotional regulation and intelligence. 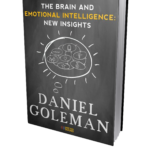 Dr. Goleman pioneered an expanded view of our thought process and here he describes the scientific basis of emotional intelligence in a readable short book.